This page lists events from January to June 2012 inclusive. Thereafter, events have been posted to the Google based Events Calendar. 21 Jun 6.00 - 8.00 pm South 1, Bldg 64, Clayton campus, Monash University BMedSc(Hons) Information night Bachelor of Medical Science 2013 Information evening for intending BMedSc(Hons) students. Short presentations about the research opportunities. Refreshments provided. See evening detail at CCS 2013 BMedSc. Download CCS 2013 BMedSc Handbook (1.1 mb). 12 Jun 11.00 am - 12 noon Lecture Theatre, Lvl 5 Alfred Ctr ACBD/Dept of Medicine seminar series Dr Chris Slape and Dr Yuping Yuan, both from ACBD. Their respective topics are: "Dysregulation of homeobox genes in myelodysplasia"; and " A New Mechanism for Leukocyte Recruitment by Pro-coagulant Platelets". 25 May 3.30-5.30 pm Lecture Theatre, Lvl 5 Alfred Ctr Dean's Shout Prof Warwick Anderson, NHMRC CEO: A career in health and medical research. The Dean's Shout is co-hosted by Prof Steve Jane, HOS CCS. Register here. 27 Apr 5.30-7.00 pm Lecture Theatre, Lvl 5 Alfred Ctr MCCC seminar Speakers: Prof John McNeil (SPHPM), A/Prof Jeremy Millar (Medicine), A/Prof Andrew Spencer (ACBD), Dr Robert Stirling (AIRMed): Cancer Registries - Joining the Dots: Linking Clinic, Laboratory and Patient Populations. All welcome. Download flier. 24 Apr 11.00 am - 12 noon Lecture Theatre, Lvl 5 Alfred Ctr ACBD/Dept of Medicine seminar series Dr Tse-Chieh Teh, ACBD: Targetting survival pathways in Acute Myeloid Leaukaemia (AML). Dr Andre Samson, ACBD: Discovery of a unique form of protein aggregation that facilitates the removal of dead cells from the body. 5 Apr 11.00 am - 12 noon Tea room, Lvl 6 Alfred Ctr MIASMA Easter morning tea. Free for staff and PG students. Download flier. For more information about MIASMA, see their web page. 20 Mar 11.00 am - 12 noon Lecture Theatre, Lvl 5 Alfred Ctr ACBD/Dept of Medicine seminar series Ms Rachael Borg, PhD student in the Fibrinolysis & Gene Regulation Laboratory at ACBD: Investigation into the plasminogen activator system and dead cell removal. 6 Mar 11.00 am - 12 noon Lecture Theatre, Lvl 5 Alfred Ctr ACBD/Dept of Medicine seminar series Dr Sheryl Gough, Genetics Branch, Centre for Cancer Research, NCI/NIH, Bethesda, MD, USA: Mouse models of leukemia and MDS - establishing causation, collaborative events, and pre-clinical utility. 1 Mar 1.00-3.00 pm Lecture Theatre, Lvl 5 Alfred Ctr CCS PhD/HDR orientation Meet & Greet@Alfred for new PhD/HDR students. Students will be introduced to Early Career Researchers, MPA, MIASMA, platform technologies at AMREP. Afternoon tea supplied. Download flier and see HDR student resources at CCS. 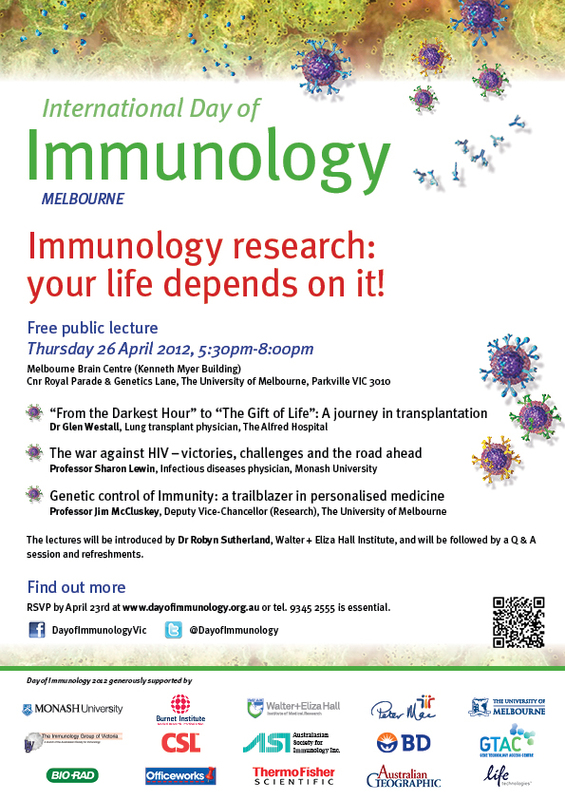 24 Feb 12.30-1.30 pm AMREP Classroom 1 Monash Infectious Diseases Society Dr Paul Cameron, Infectious Diseases Unit, The Alfred/Dept of Immunology, Monash University: Lymphocyte geography and travel: is it important?